David is the most recent addition to our team. He’s played with every well-known Irish musician or performer in his 25-year long career. Having learned the ropes with his Dad touring with show bands David performed his first lead-guitar gigs at the tender age of 14. His masterful talent and dexterity allow him to conquer the most difficult guitar anthems and riffs. Hi favourite artists include: Guns’n’Roses, Bon Jovi, Van Halen, Rory Gallagher, Thin Lizzie, Gary Moore, Led Zeppelin, Pink Floyd, Toto, Supertramp and the Eurythmics. 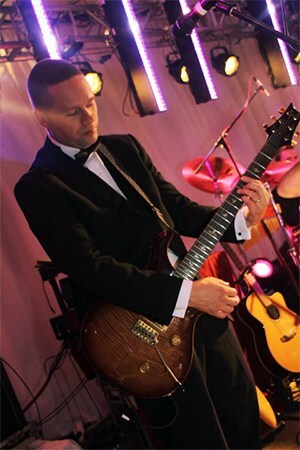 David has played with Artists such as: Mary Black, Enya, Bonnie Tyler, Johnny Logan, Chris DeBurg, Dickie Rock and Don Baker to name but a few….